I've had some great listening moments lately on long bus trips and crowded subway rides. I love reading a physical paper. This week it's been The Village Voice. Hailing from a place where there are three places to eat breakfast, one good Thai restaurant and new, worthwhile restaurants popping up only every so often, being in New York City is my culinary dream! It was unseasonably warm and my feet felt like they were bleeding and the ice cream tasted just like heaven. Consistent the last several days: Grandma's ring, novelty socks, a colored wrist band, Apple watch, something black, blisters. "Twin Peaks." ! ! ! I've only watched the first hour (don't call them episodes--it's an 18-hour work), but I think we're all in for a treat. Riveting! Exciting! It's finally here. Today I met the founder and creative director of one of my favorite shoe brands (Loeffler Randall), Jessie Randall. 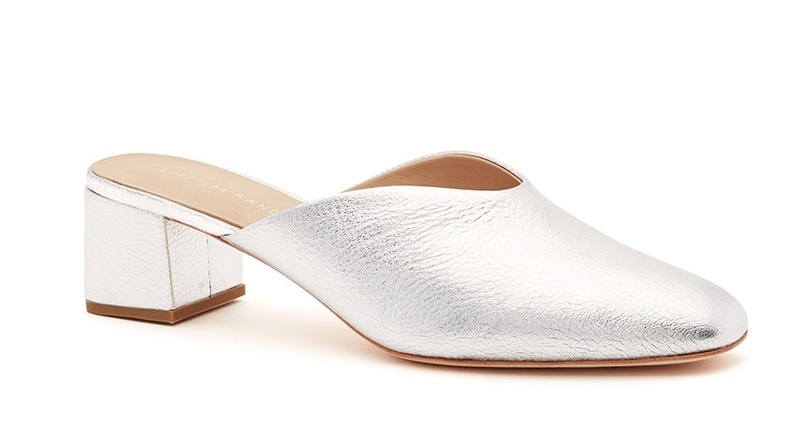 Her and one of my editor's were wearing the Lulu mule in silver and let's say I've got shoe envy. I also met Jenna Lyons (! ! ! she was the sweetest and took my business card ! ! !) I want to wear billowing culottes and white sneakers and kimono jackets like her. Or anything like her. Lots of wants when you exist in the city of dreams.